China in Africa: The Real Story: Mysterious Chinese Imports from Africa? Interesting point. Whose statistics are we looking at here? This is supposedly Chinese import data, although I got it from someone at the WTO who got it from a data company. I haven't checked, but presumably it could be confirmed in IMF DOT? I am in China, and am having trouble adding to your blog. I just wanted to say the answer to the trade question if anywhere should be in the UNComTrade database. DOTS is mostly only useful at a macro balance of trade level. UNComTrade is much more detailed. What would be interesting is to breakdown that line by country at the African reporting end. The problem is that it's easier to analyse China-Africa trade from the Chinese end because that's the only way the data across dozens of African countries is any way empirically consistent - but indeed, probably at the cost of accuracy. Thanks for your comment. UNComTrade is a great idea ... but I will have to leave it to others to investigate it. I now narrowed down the problem. Commodities NES come ONLY from South African Republic. So what might China have bought there? I used to have some business dealings in between South Africa and Asia. Can someone check South Africa's exports to China, from the South Africa side? Yes they are simply 30bn lower than the Chinese claim. That is the value of the NES imports from SAR. My guess is that if each country decides, it is probably not sinister it is just that the "Misc" categories are piling up. Where is this data coming from? For Chinese customs import data I am not aware of a "misc" category like that so if you had the time and patience, you could probably do a country by country comparison of the Chinese imports and African exports, and narrow down what's being thrown into that category. The other possibility is that some African countries are classing non-commercial trade differently. So for instance if I export cocoa through commercial deals but I also have a cocoa-backed loan from CBD, I lump that loan repayment shipment into the separate category. Possible? Again, it should be possible to discover through a country-by-country comparison since as far as I can tell, China Customs Admin does not treat bi-lateral treaty shipments separately. (There was some doubt about that with North Korea, but when I looked into it it certainly seemed like the NK grains shipments were turning up in customs data). Apparently when the data is broken down country by country, the products in the HS 98 category seems to be mainly coming from South Africa. 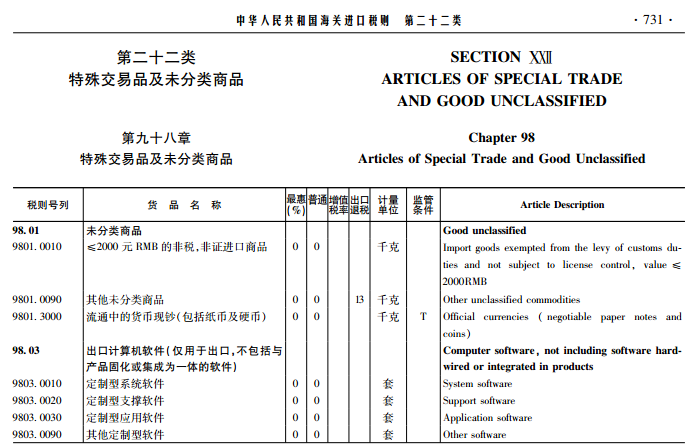 The Chinese use the same Harmonized Tariff system used by most countries (for more on this, see http://en.wikipedia.org/wiki/Harmonized_System and http://www.3ceonline.com/faq-copy.php ) This latter site says that the importer is the one who does the HS classification and that many employ a third party to do this, as it is so complicated: "HS classification is extremely difficult. Several government studies have shown that 30-50% of all Customs entries are misclassified (depending on the industry examined)." The HS 98 special provision category is up to each country to define. We define it one way in the US, the Chinese could define it another way. Has there been a change in this recently? What is covered in the HS 98 category in China and why has it risen so sharply? Maybe it is a residual for goods imported, but waiting to be properly categorized? Sorry it does not "seem to be mainly" coming from South Africa, but all of it is coming from there. Doesn't depend on whether you use HS or SITC classification. Also, as I wrote before, there is a mismatch between Chinese import data and SAR export data which is exactly the value of this NES. Maybe it is just an error on the Chinese side. Could be an error, but doubt it, as it seems to have happened for the last 3 years. It would be great to hear from China customs as to what is being put into HS 98. I will add the Chinese definition of HS 98 to the posting above.